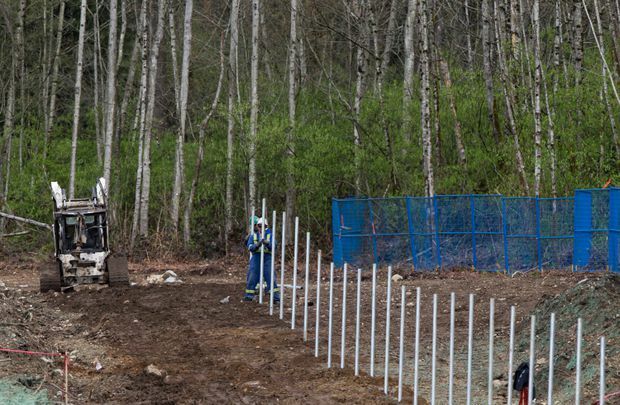 A worker sets fence poles in preparation for the Trans Mountain pipeline expansion project in Burnaby, B.C., on April 9. The BC NDP government came to power last July telling voters it would fight to kill the project, but has since abandoned that language. But the province is not willing to pull back on its opposition to the Kinder Morgan pipeline in exchange. “There is not a relationship there,” B.C. Environment Minister George Heyman said in a recent interview. He was asked, several times in several ways, what measures Ottawa could provide in exchange for the province’s support for Kinder Morgan’s pipeline expansion project. Ottawa has offered to work with B.C. to address its concerns, but that conciliatory mood has a fast-expiring shelf life. Last week, on the same day that B.C. went to court seeking jurisdiction to limit the transport of heavy oil, Ottawa released a formal response to the province’s concerns about oil-spill response. The 24,000-word essay is a rebuttal to B.C.’s claims that Canada has not done enough – and isn’t planning to do enough – to protect the coast from a catastrophic oil spill. “British Columbia does not address the robust federal safety regimes, the long-standing scientific expertise, and significant recent investments made by the Government of Canada related to spill management,” said the paper, which was filed in response to B.C.’s current round of consultation on oil spills. The federal government says it has already addressed the existing gaps in oil-spill protection – gaps that were revealed in the Marathassa and Nathan E. Stewart spills – with its $1.5-billion Oceans Protection Plan. Although the plan covers all three of Canada’s coastlines, it was announced at the same time that the Trudeau government gave approval for Kinder Morgan’s expansion project. This is Ottawa’s answer to concerns on B.C.’s coast about the increased oil-tanker traffic that will result from the Kinder Morgan expansion project. In Victoria, the Horgan government says the plan does not go far enough, and B.C. has outlined six areas where it says Ottawa must do better. Those include assurances on spill response times, regional marine-response plans and commitments to compensation for loss of public use resulting from a spill. But Mr. Heyman said meeting these demands would not lay a path that would see his government embrace the project. “This particular project is very risky,” he said. The BC NDP government that came to power last July told voters it would fight to kill the project. However, it has since abandoned that language, because the province’s legal advisers warned that B.C. must not be seen to frustrate the federal government’s approval of the pipeline. Instead, the province is seeking the ability to control any additional flow of diluted bitumen across the province by any means – truck, rail or pipeline. Its carefully crafted reference case filed in the B.C. Court of Appeal makes no mention of Kinder Morgan.